The Discovery astronauts parked the Leonardo cargo module in the shuttle's payload bay Friday and carried out a final heat shield inspection to set the stage for undocking Saturday from the International Space Station. The inspection of the shuttle's carbon composite nose cap and wing leading edge panels normally is carried out after the shuttle leaves the station. But the failure of Discovery's Ku-band antenna earlier in the mission forced the crew to move the examination up one day so the laser scan data could be downlinked to mission control using the station's communications system. Complicating the timeline, problems with the berthing mechanism that held Leonardo in place on the space station delayed the module's transfer back to the shuttle. Instead of berthing the cargo carrier Thursday as originally planned, the astronauts, using the station's robot arm, left it parked just above the shuttle's cargo bay overnight and completed the installation early Friday. "This has been a set of fun-filled days, to say the least, for the on-orbit crew and for the operations team," said Flight Director Richard Jones. "We've been working through quite a few late-breaking issues, but we handled each one in stride. I must say, I'm very proud of the teams on how well they handled and responded to all the adversities we've been faced with over the past few days." The Leonardo berthing went smoothly and "we finished up this shift by accomplishing what we call the docked late inspection," Jones said. "We had to perform these docked late inspections as a result of the Ku failure we've got on board Discovery. We weren't going to be able to downlink any of the imagery that we collected had we done this after undocking like we normally do. So we accomplished that today. The crew literally just flew through it, they were well ahead of the timeline." It will take most of the day to downlink the multi-gigabyte data files to analysts at the Johnson Space Center in Houston. Jones said Discovery's crew likely would be cleared for undocking Saturday even if the analysis is not complete. "Typically, it's a little bit more than 24 hours before we have a final decision on whether or not there are any issues with respect to the wing leading edge or the nose cap areas," he said. "Do we have to have that data in hand before we undock? No, we don't. What we will have are some preliminary assurances that what we have shows no surprises." As with all station assembly missions, the shuttle has enough fuel on board to re-rendezvous with the lab complex if any major problems are detected. 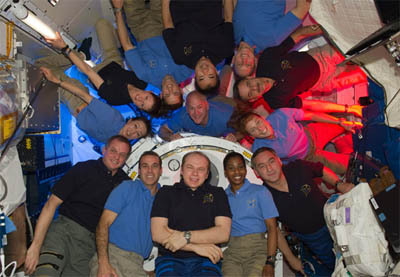 The astronauts plan to go to bed around 4:21 p.m. Wakeup is scheduled for 12:21 a.m. Saturday. After a final joint meal and a brief farewell ceremony with the space station's six-member crew, the Discovery astronauts will move back into the orbiter and close the hatch around 6:11 a.m. Undocking is targeted for 8:52 a.m.